Complimentary tasting and 10% off all wine purchased during your visit. Please call for an appointment on other days of the week. Winter hours change to 11-5 for all days. We will of course stay later if customers are visiting the tasting room. Groups of 8 or more welcome, but please call ahead. Lagana Cellars is one of the newest wineries in the Walla Walla Valley, founded in 2013 by Jason Fox. 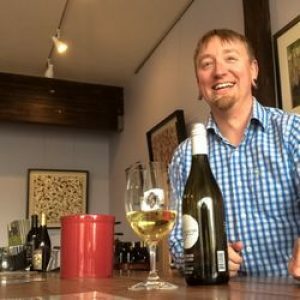 A graduate of Walla Walla Community College’s Enology and Viticulture program, Jason soon discovered his desire to make white wines crafted to be crisp, clean and delicious. Our primary goal is to create terroir-driven wines with varietal character and elegance. While touring the heart of downtown Walla Walla, duck into our intimate tasting room and enjoy some of our luscious reds and crisp, clean whites. We are located at 6 East Rose St, a short stumble off of Main Street and kitty-corner to the Marcus Whitman Hotel. Hope to see you soon! Have you ever had that pivotal Wine Moment in your life? For Lagana founder and owner Jason Fox, it was the 2005 Chateau La Croix de Gay Pomerol, and with all due respect to the film Sideways, that f’ing Merlot was amazing! It had the characteristics of a truly balanced wine where terroir and process mattered: pure tannin structure, acidity, fruit and earthiness. At that moment, Jason was hooked, and not long afterwards, moved to Walla Walla to study winemaking. It was at Walla Walla Community College’s Enology and Viticulture program that he discovered his passion for making whites – crisp, clean wines with little or no oak that are pure expressions of the grape, terroir and vintage. No two wines are alike across vintages and vineyards, which is what makes them fun to taste as well as tell their story. In 2012, Jason interned at one of valley’s oldest and most respected wineries, Walla Walla Vintners. Working with Gordy Venneri and Myles Anderson’s winemaking team, he learned to love the art of making red wines that are complex and interesting with an elegant interplay of tannin and fruit. His goal with reds is to make aromatic and luscious wines with less oak and more varietal character. We can’t wait to share our wines with you, hope you’re able to stop my soon!